1. Also known as snow monkeys, these primates live in Japan’s forests, highlands, and mountains. They are the only primates to live so far north besides humans. 2. They have white and black fur and oval shaped feet. Snow monkeys have a pink face and it is shaped like a human face. It’s nose is like a human nose. Snow monkeys have brown eyes and pink ears that are shaped like human ears. They have a fat and oval shaped body and have really short tails. Snow monkeys have black hands that are shaped like human hands. They have skinny arms and they have short legs. 3. Macaques withstand temperatures from about 5 degrees Fahrenheit (-15 degrees Celsius) in winter to about 73 degrees Fahrenheit (23 degrees Celsius ) in summer. Thick winter fur and stored fat helps keep the primates warm in cooler months. 4. Macaques travel mostly on all four feet, but occasionally they stand and move on just their hind legs. 5. Japanese macaques are one of at least 15 macaque species and over 150 monkey species. 6. Male and female macaques live together in groups ranging from just a few to more than a thousand. The average size is fewer than 200. 7. Grooming is important as a social ritual to Japanese macaques-they spend a good part of each day removing parasites from each other. They rest for at least two to three hours a day. 8. In snowy regions macaques sleep in deciduous trees where snow won't fall on them. 9. 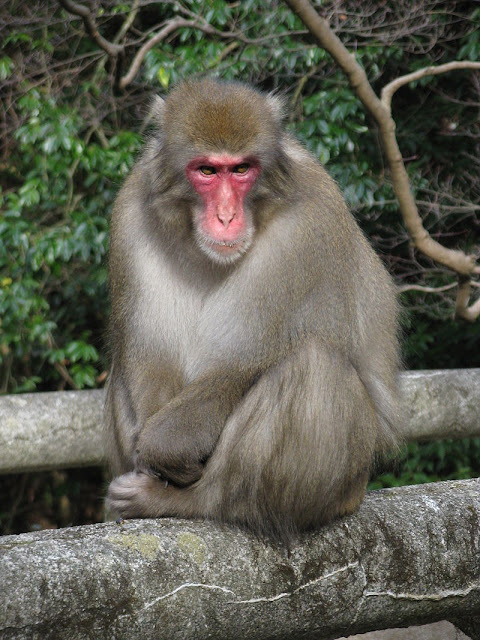 Japanese macaques sometimes raid farmers’ crops. One of the macaques goes ahead, usually at dawn, and gives an all-clear symbol to the rest of the troop. A few monkeys act as lookouts for humans while the rest grab the crops. 10. Macaques have a number of vocalizations for different situations: warning, mating, defense, and fighting. 11. Young macaques all play, swinging in trees, fighting over items, and playing with stones. When there is snow on the ground, the monkeys often make snowballs, rolling them until they get too big or break up. 12. Possibly begun in imitation of humans, macaques in Jigokudani, Japan, head to hot springs for bathing and playing. 13. Japanese macaques in the wild eat a broad diet: fruits, seeds, leaves, bark, fungi, bird eggs, snails, crayfish, and fish. They also eat soil, probably to soothe upset stomachs but possibly also for flavor, nutrients, or digestion. 14. Major predators of macaques today are feral dogs and humans. 15. Japanese macaques, also known as snow monkeys, are important in Japanese culture. These “celebrity” animals even draw tourists. 16. Japanese macaques seem to have culture. It usually starts with a 'genius monkey,' the Einstein of the troop. When that monkey develops a new behavior that works, other monkeys learn from it and pass it on, sometimes from generation to generation. Among enduring Japanese macaque innovations: cleaning sand from wheat by dipping it in water, keeping warm in hot springs, and making snow balls. 17. Snow monkeys play a special role in mythology, folklore and art in Japan. Most familiar are the three monkeys which represent the wisdom of Buddha: see no evil, hear no evil and speak no evil. 18. Both parents and other adults share the role of raising infants. 19. Snow monkeys are Old World monkeys (possess a non-prehensile tail and nostrils closer together). 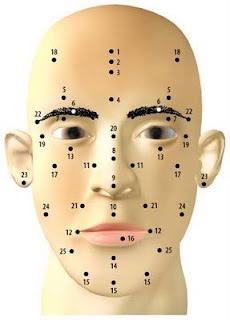 They are most known for their red, hairless face with low brow ridges. 20. They are the largest of the macaques. 21. One way Japanese macaques deal with the cold is by soaking in 100-degree-Fahrenheit (38-degree-Celsius) volcanic hot springs. Troops that live near hot springs will spend about 30 minutes a day in them. This practice was first seen about 40 years ago in monkeys who had observed humans bathing in the natural hot springs. A monkey reportedly tried it, liked it, and passed on his new habit to her troop.